Solar System: Did You Know? Creation Testifies! First image ever taken by humans of the whole earth. Video of Apollo 8 Bible reading. The Lunar far side as seen from Apollo 8. After launching on December 21, 1968, Apollo 8 took 3 days to travel to the moon. 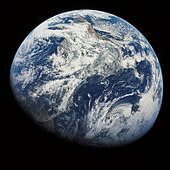 The three astronaut crew (Commander Frank Borman, Command Module Pilot James Lovell, and Lunar Module Pilot William Anders) became the first humans to travel beyond low Earth orbit, the first to see Earth as a whole planet, and then the first to directly see the far side of the Moon. Apollo 8 orbited the Moon ten times over the course of 20 hours, during which the crew made a Christmas Eve television broadcast in which they read the first 10 verses from the Book of Genesis. As they rounded the Moon for the ninth time, the second television transmission began. Borman introduced the crew, followed by each man giving his impression of the lunar surface and what it was like to be orbiting the Moon. Borman described it as being "a vast, lonely, forbidding expanse of nothing." Then, after talking about what they were flying over, Anders said that the crew had a message for all those on Earth. Each man on board read a section from the Biblical creation story from the Book of Genesis. Borman finished the broadcast by wishing a Merry Christmas to everyone on Earth. 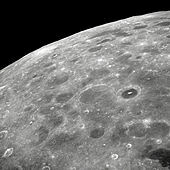 His message appeared to sum up the feelings that all three crewmen had from their vantage point in lunar orbit. Borman said, "And from the crew of Apollo 8, we close with good night, good luck, a Merry Christmas and God bless all of you - all of you on the good Earth." At the time, the broadcast was the most watched TV program ever.